In 2011, the state of Massachusetts was ranked the 9th safest bicycling state in the Northeast. In 2010, we ranked in at 16th place and in 2009 at 19th place, according to a study conducted by the League of American Bicyclists. In 2012 we are ranked in 3rd place! We’re getting better and our roadways are getting safer for bicyclists, but we still have a long way to go. For the fifth straight year in a row, Washington ranked in at number one. 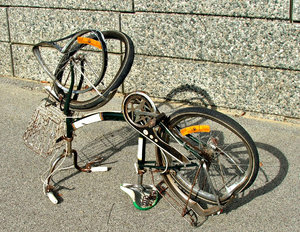 Unfortunately, even with a 3rd place ranking bicycling accidents in Boston and elsewhere are still a common occurrence. “We are encouraged to see significant progress in top states like Washington, Minnesota, Colorado [which ranked fourth this year] and Massachusetts,” said Andy Clarke, president of the League. Our Boston bicycle accident lawyers understand that this recent study illustrates there is still much to be done to make our roadways safer. Thousands are still being injured on our roadways every year. Many of these changes need to be done in funding and in infrastructure. Overall, the study concluded that state DOTs and legislatures across the country are lagging behind when it comes to bicycle safety even though there’s a much higher demand for safe riding areas. In the study, the League of American Bicyclists looked at each state’s enforcement and legislation, programs and policies, funding and infrastructure, encouragement and education and their planning and evaluation. States were then ranked on these categories and their contributions to bicycling traffic. Richard A Davey, the Secretary for the Massachusetts Department of Transportation (MassDOT), said the department marks its commitment to provide residents and visitors with efficient, healthy and safe forms of transportation and continues to push the importance of the GreenDOT policy. In April, the League of American Bicyclists named MassDOT and another 66 organizations as being Bicycle Friendly Businesses. Our state was the first state to have its DOT to receive national recognition for this kind of thing, according to the Boston Globe. Recently, MassDOT launched the GreenDOT program to help to push environmental responsibility and a sustainability initiative to help make our state a national leader in “greening” the state transportation system. With pushing bicycling in the city, officials have also had to make some changes along our roadways to protect these travelers. Awareness of bicyclists has also been important with the re-launch of the Hubway system, which allows residents and visitors to rent a bike, ride to their destination or where ever else and just return it to another kiosk in the area. We may be ranked higher than many of our neighboring states, but it’s no time to rest. We need to continue pushing forward to making biking in Massachusetts the safest it can be! If you or a loved one has been injured in a bicycle accident in Boston, Quincy, Taunton or elsewhere in Massachusetts, contact Injury Lawyer Jeffrey S. Glassman for a free and confidential appointment. Call 877-617-5333.